Paradise on Padre is truly an Island Oasis Getaway! This unique and stylish 2700 square ft., two level home with 3 bedroom and 4 baths, sleeps up to 18 guests comfortably. Its wrap around balcony offers beautiful views of the Gulf. Both levels have a large, well equipped kitchen, dining and open living areas with a nice backyard, Great for BBQing and entertaining. It’s a perfect place to stay for big families or large groups. This home is loaded with extras and beautifully decorated for a fun beach vacation. 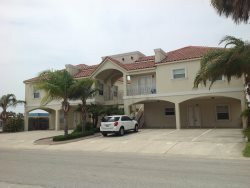 It is only a ¼ of a block from the beach and walking distance to restaurants, shopping and grocery stores. SPRING BREAKERS WELCOME, but note, if renting in MARCH, a cash security deposit will be added, limited parking, wristbands are required, and no extra guests or house parties.